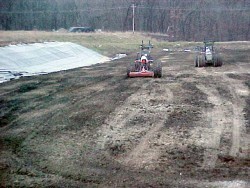 Soils Remediation - Free Flow Technologies, Ltd. Permanent stabilization reagent products for insitu remediation of any soils or sludges contaminated with heavy metals. Free Flow Technologies, Ltd. was contacted by a national remediation contractor for assistance with a 15,000 ton remediation project at a steel plant in Indiana to treat heavy metals related waste streams. The criteria were to meet UTS levels for RCRA metals and SPLP for lead at 0.75 mg/l, guarantee effective results, be competitive, and ensure on-time delivery. While that is a tall order with some treatment reagents, it is not out of the ordinary for Free Flow. Free Flow reagents are a nonreversible chemistry that meets the stringent requirements of TCLP and SPLP, and we guarantee it in writing. Through our strategic positioning in the Midwest and integrated trucking network, we load trucks during the night and can provide next-day delivery anywhere in the Midwest. The contractor was appreciative of this arrangement and enjoyed the cost savings factor of over $100/ton of product delivered in comparison to any competitive product suppliers. The effectiveness of the Free Flow reagent gave the contractor the assurance needed to treat in high volume without concern over treatment failures, and provided on-time delivery, averaging 75 tons of product per day. Free Flow chemistry was selected to treat lead-impacted soils on site for a national remediation contractor. 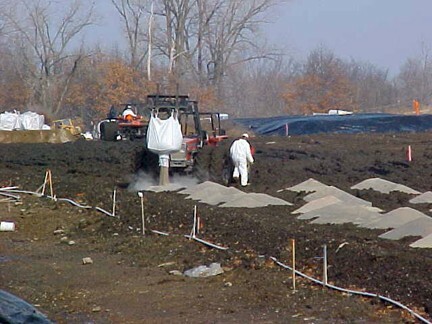 The contractor attempted to treat the contaminated soils with local fly ash materials, however, the lead continued to leach out above regulatory limits. Free Flow Technologies suggested a 4% application rate of the standard Free Flow reagent. The results were 100% successful with the TCLP results no greater than 0.23 ppm for lead on the treated material. A Colorado-based hazardous waste disposal company origianlly quoted the remediation contractor $250,000 to dispose of the fly ash treated soils containing lead. 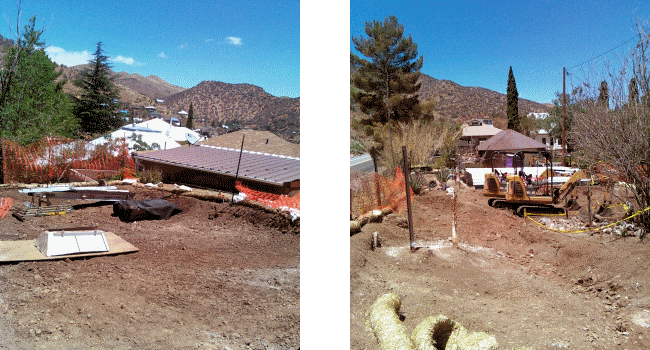 The cost for the Free Flow reagent materials delivered to the jobsite to treat the soil was less than $10,000 — a significant cost savings for contractor's client. Additionally, the client was pleased with the ease of mixing the Free Flow reagent into the soil. 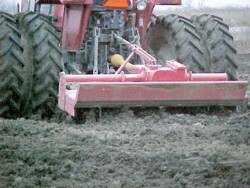 The product quickly disperses throughout the soil with a tilling process that requires minimal labor. Contact us today regarding your industrial site application and treatment needs. Based on custom blending and the ability to produce a virtually dust free product, Free Flow reagents deliver superior results using low dosages. Free Flow was utilized to stabilize a variety of heavy metals including lead, chrome, cadmium, antimony, selenium, and zinc at several locations on site. The project was completed in conjunction with U.S. Army Corp of Engineers and Texas Commission on Environmental Quality. The project involved the treatment of 12,000 tons of soil. Free Flow reagent was chosen over the competition and approved by the Army Corps of Engineers and U.S. EPA as the most effective reagent for this project. We provided the treatment reagent and engineering oversight for the effective treatment of 8,000 tons of heavy metals contaminated soils at an army ammunition plant. Free Flow was required to treat for all eight (8) RCRA metals to below the TCLP levels. The primary metal of concern was barium with lead and cadmium and the other metals as a secondary concern. 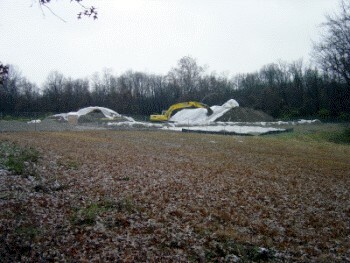 Stabilization of 5,000 tons of lead contaminated soil at a former Navy base small arms firing range. The remediation contractor selected Free Flow stabilization products for the treatment reliability of the chemical reagent and the ability to economically deliver the product to the site. Free Flow performed a bench scale treatment study and determined a specialized blend of Free Flow's chemistries would be required to overcome the alkalinity demand of the contaminated soil. Despite dodging multiple hurricanes and torrential rain the contractor was able to successfully treat the contaminated soil using a 5% dose rate, resulting in a substantial savings for the Navy base compared to using other treatment reagent brands. The application of the reagent was accomplished by mixing the dry reagent blend with traditional construction equipment, saving time and expense versus more complicated and costly procedures such as a pug mill mixer. 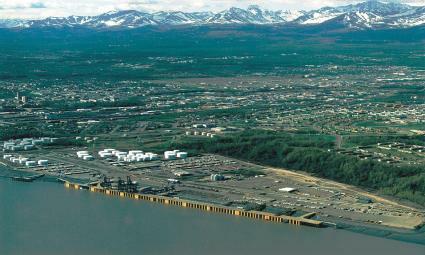 Stabilization of lead remediation contaminated soil at an Air Force base in Alaska. The product was specifically designed for this application based upon bench scale treatment studies using the Free Flow reagents. The product was produced and distributed from the facility in Loves Park, Illinois. The product was packaged in one (1) ton bulk bags which simplified handling and application at the project site. Transportation and delivery logistics, which included multiple transfers from trucks and barges, were easily accomplished meeting the challenging delivery deadline. Each product delivery reached the destination on schedule saving the client costly operational delays. Once delivered to the stabilization site location the product was easily transferred directly from trucks to the mixing location where the bags could be opened and the appropriate predestinated amount was applied to the mixing area. Contact us today regarding your military or gun/shooting range site application and treatment needs. From river sediments to sludges and tank sediments, Free Flow reagents deliver the most effective treatment at low dosages saving you money. 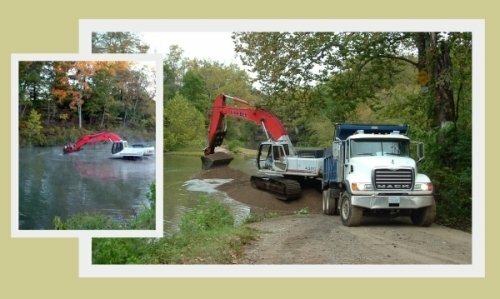 USEPA recently completed a field demonstration project to treat lead contaminated sediment and soils in and along the Big River near Desloge, Missouri. The Agency along with an approved EPA consultant and contractor selected Free Flow Technologies, Ltd. (Free Flow) as the chosen vendor to supply the treatment reagent for this project. As a result of Free Flows successful track record for treating numerous sites in Missouri on related lead contamination projects, Free Flow was determined to be technically effective, cost efficient and the right fit for this application. 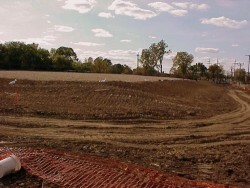 The field demonstration involved the treatment of 500 tons of dry bank soils as well as 500 tons of wet river sediments. Both the soils and sediment had tested hazardous by the USEPA's TCLP evaluation for lead. Free Flow conducted bench scale treatment studies and determined a 4% application of Free Flow 200 would achieve the desired TCLP result of < 5mg/L lead. 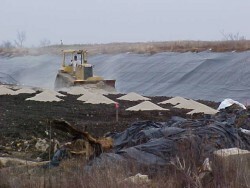 Free Flow reagent was transported to the site in end dump trailers was stored on the ground and covered with plastic sheeting to protect the stockpiled reagent. Utilizing traditional construction equipment the contractor moved the additive from the stockpile with a small front end loader to the treatment area where a large tract excavator mixed the reagent with the contaminated material. The reagent is granular in nature making it very user friendly for the contractor and with its low dust generation makes it user friendly for the EPA. Subsequent to the treatment application and mixing, samples were collected and sent to the EPA laboratory for testing. Analytical results confirmed both pilot test areas had achieved passing results with TCLP results of < 5 mg/L Lead. The passing results allowed the treated material to be transported to a non hazardous Subtitle D landfill saving the taxpayers the additional cost of handling the material as hazardous waste. Based upon the success of the bench scale and field pilot demonstration Free Flow has positioned itself to be the front runner in providing clients with a proven cost effective reagent to successfully treat heavy metals contamination in a wide variety of applications and conditions. All parties associated with this field demonstration from the EPA, consultant, contractor and supplier were all well pleased with the results of the demonstration. Contact us today regarding your sediment or sludge treatment application needs. Using Free Flow reagents to treat your mine tailing waste that is contaminated with heavy metals will help protect the environment while saving money. Free Flow Excels in SPLP — Free Flow treatment reagents are used to treat mine waste at an on-going reclamation project in the southwest US. While all treated TCLP results were well below standards for Lead and Arsenic, the agency in control of the standards elected to implement a tighter standard by switching to the Synthetic Precipitation Leaching Procedure (SPLP) for a demonstration of effective treatment. This meant that the Free Flow product would be required to treat the Lead and Arsenic to the drinking water standard and not the TCLP standard. This would be a challenge for most chemistries, however the Free Flow had no problem in meeting the standard at the same low dosage of 2% that was currently being utilized. Free Flow continues to be a leader in providing treatment reagents for a variety of industries demonstrating that for every waste problem there is a solution. As noted in the mountain range photos, the Free Flow product can be applied in virtually all applications with minimum dust intrusion. Free Flow provides treatability studies on all waste streams with the capability of producing a custom blend should this be necessary for your specific application. Give us a call and allow us to assist you in solving your waste issues. 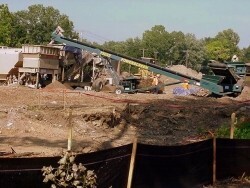 Free Flow 200, a heavy metals stabilization reagent, was successfully used for the treatment of mine tailing wastes at a project in Galena, Illinois. 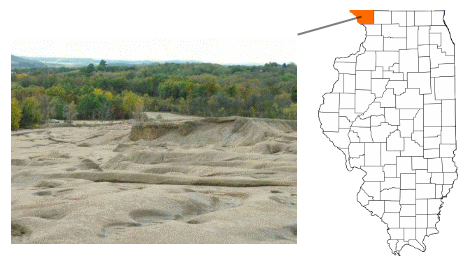 The property which is part of the large regional Galena lead mining area is being slated for future development and required a "clean bill of health" from the Illinois EPA prior to any potential future site activity. The property was tested and determined to contain high levels of up to 250 mg/L TCLP lead. 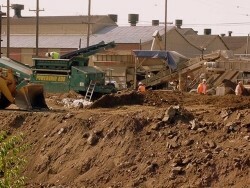 The EPA requires soil with levels of greater than 5 mg/L of lead to either be handled as a hazardous waste and taken to a Subtitle C Hazardous Waste Landfill or to be treated in situ and meeting the 5 mg/L standard allowing the waste be to handled as a Special Waste and taken to a subtitle D Special Waste Landfill. The subtitle D option has significant cost savings benefits versus the Subtitle C alternative. 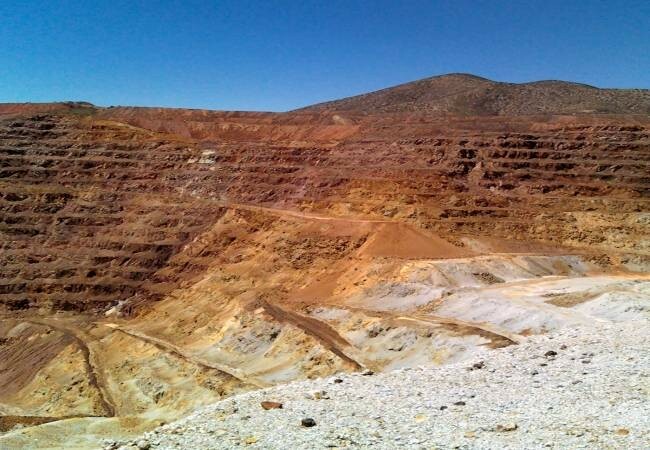 Contact us today regarding your mining waste application needs.